The Musée d'Orsay is a museum in Paris, France, on the left bank of the Seine. 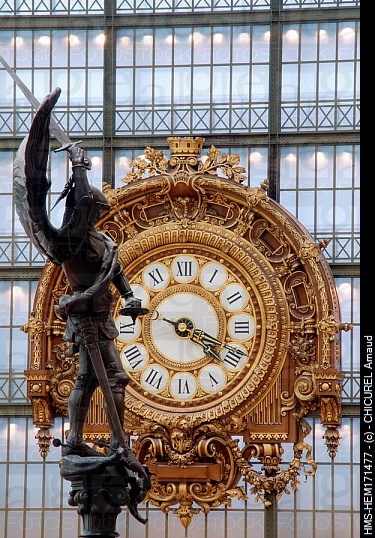 It is housed in the former Gare d'Orsay, an impressive Beaux-Arts railway station built between 1898 and 1900. The museum holds mainly French art dating from 1848 to 1915, including paintings, sculptures, furniture, and photography. It houses the largest collection of impressionist and post-impressionist masterpieces in the world, by such painters such as Monet, Manet, Degas, Renoir, Cézanne, Seurat, Sisley, Gauguin and Van Gogh. Many of these works were held at the Galerie nationale du Jeu de Paume prior to the museum's opening in 1986.